has MS'd a Serp front end, and how exactly did you go about it ? Anyway, back to the Serp / Trigger wheel / How issue anyone have any experience ? I have the 3.9 serp and the Ford pressed steel trigger wheel fitted perfectly. Also had to come up with a new position for the coils. Dizzy can be binned and replaced with a turned plug. Can do some pics if you need them. When I get a round tuit, I will be Jolting the 3.9 serp that is currently awaiting rebuild as a replacement for my current non-serp engine (which uses the Ford TW) - I have had a cursory glance and decided that the Ford TW would work on the new one similarly to the current one, but I would love to see pics of how you did it. No knowledge is ever wasted! WRT to sensor bracket and twin coil mounts at a reasonable price - I could definitely be interested, but can I suggest that once you have your coilpack mount sorted you also define what HT lead dimensions work with it? Have some pics but I'm having issues with my gallery. Will have to load them to a picture host then link them but have other things to do at the moment..laters. 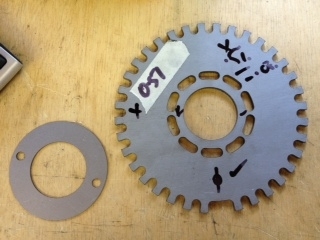 It just so happen's that a man enquired about Squirting a 4.6 serp so any info about whether to use a HFH trigger wheel or is it possible to use the flywheel sensor's would be useful as well. These shots show the trigger wheel and sensor plus brackets. 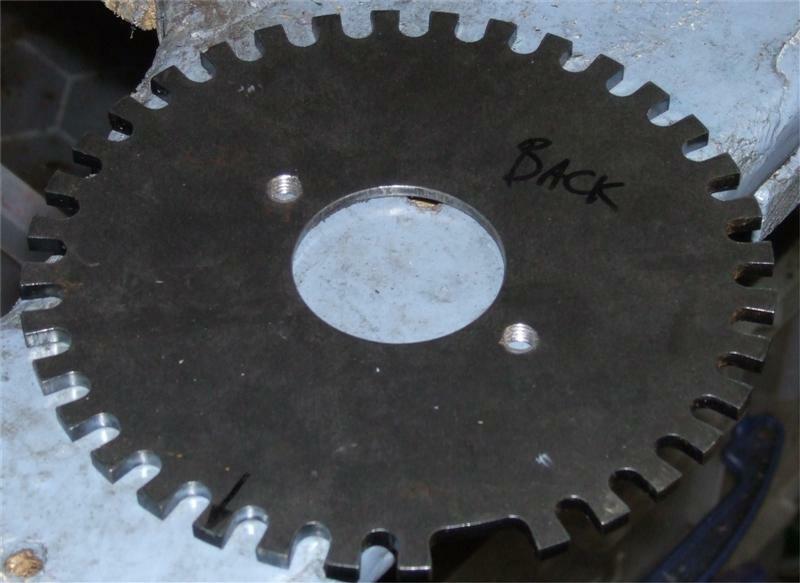 The wheel is the Ford pressed steel jobbie. You just dismantle the pulley and trap it in between. It is quite simple to get running true as you can make some spacers to go around the outside of the damper to hold it true whilst you tighten. I then filled between damper and trigger with polysulphide so that stones and mud cannot get trapped and bend the sensor. You can cut back the filler so you can still see the timing marks. The coil packs won’t fit above the water pump as they do on the non-serp so I had to move them over. The mount is two Ford mounts welded together with an extra piece of angle iron across the front and drilled to suit the bolts through the engine casting. At the back the mount is secured to the engine lifting eye with a very large washer. You can also see the dizzy replaced by a turned ali bung. You can use the OEM crank sensor, no problem. No use if you want to use Ford parts to run your motor but fine if you drive the coils direct. It's a VR sensor that works with the normal MS v3 PCB circuits. the number of teeth and position varies depending on the age/ECU being used. I've got trigger wheel from triggerwheel shop, got it machined in the middle so it fits between the pulley and the "collar". The picture with the red circle is still without the trigger wheel machined - it was touching the part where the red circle is. After machining - no problem. Cheer's Dave it's down to the fellow but I will try and steer him away from COP's as it's a PITFA and the MS V3 is from the usual suspect so ford part's are easiest. You wouldnt be using COP, you'd be running wasted spark with BIP373 coil drivers inside the ECU, or an external driver like the bosch 211. Needs slightly more tweaking to set it up, but not that much. Given that this approach is now the recommended approach according to the MS&E people i cant see it being a problem, and using something like the Bosch 211 will keep the electrical noise from the drivers away from the ECU itself too. Thanks for the pics. Your trigger wheel solution is almost exactly the same as mine except that I used Sikaflex to 'pot' mine. I like your 'bracket on a bracket' sensor mounting - that is such a simple idea which must make fine setting so much easier. Any news on the HFH serp trigger wheel Nige? one style of Serp Pully , so more to come. On the stylee in the pics, the tigger wheel fits flush to the outer OD of the pully wheel, and a small and I mean small amopunt is lathed off the Pulley rear so as to allow the toigger wheel to sit flush and even across the back, then the position is marked and a Ident marked on both wheel and pulley for location, and then the pullet drilled and bolted together, more puisc to follow, but this does seem to be a neat solyution to serp pulleys for megasquirt, and the wheels won't be too much money, More to come. It's a 4.6 that the gent want's MegaSquirtin so I will find out the year. Nice pictures. They give good understanding of what is needed. 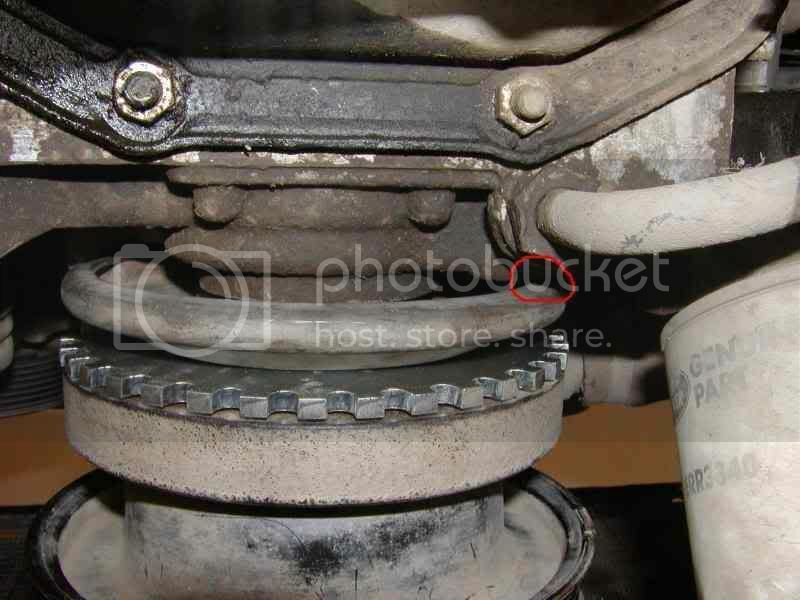 Anyone documented the way of removing/reinstalling the pulley? What are the difficulties to expect? Do I have to remove the rad? 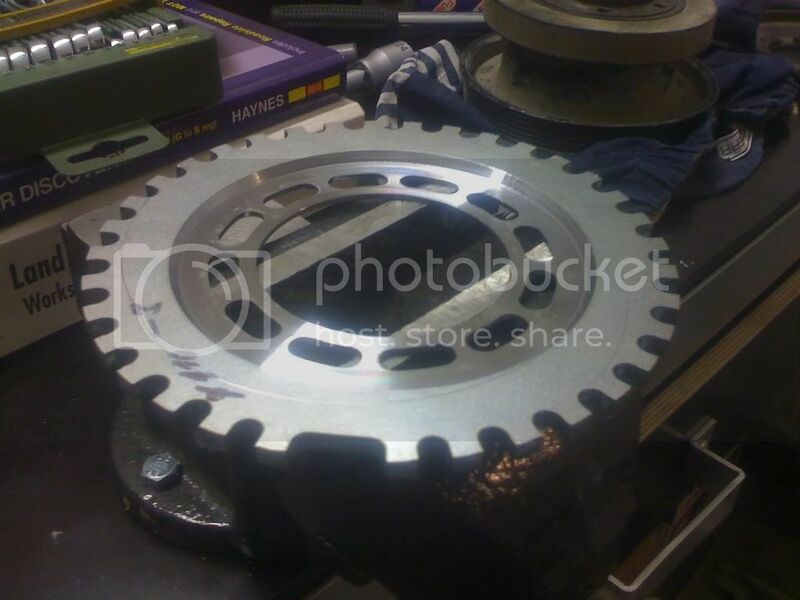 What's the proper way of putting the belts back on the pulleys? How long does it usually take to get it off and then on? What's the proper torque for the main nut? oh, that's quite important. what's the inner thread for those mountings on the block? and what's the thread of those bolts on the pulley? Nige, mine is 26D series. Are you sure those were metric? Actually I was asking about the mounting bracket - what bolts do I need to get it in place? Btw, what was initial designation for those two holes? A 12.9 for holding on a trigger wheel? That's a bit excessive, isn't it? 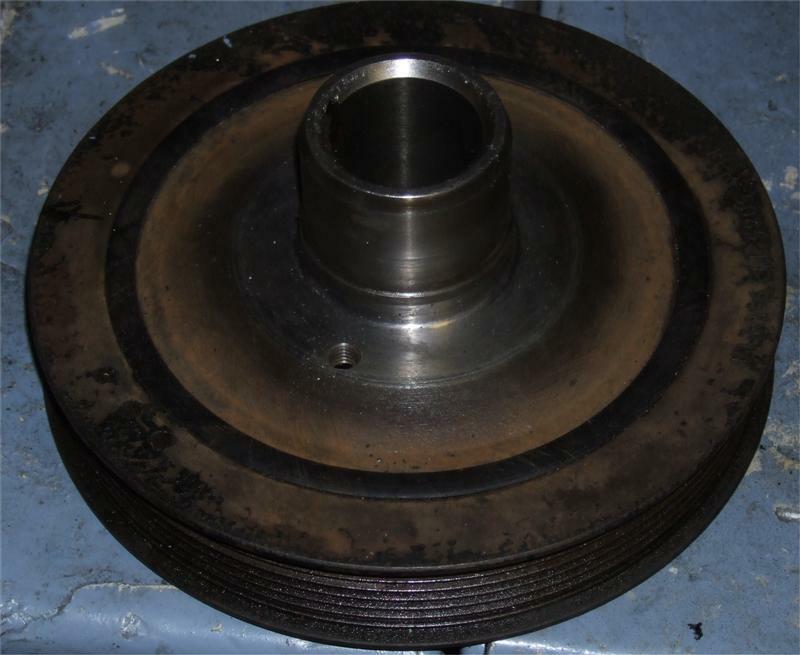 "High" RPM on a tree stump, sheared it so the wheel span. I had 2 x 12.9s with me, we refitted them "In situ" (translation with it jammed on rock ) his restart and subsequent move up and forward was sort of where he left off. The trigger wheel did its chainsaw work and he got on and onwards - they have been there since ! "Abuse know no limits "
Hmm, in that case I'd rather carry two extra low-grade bolts that can shear than ruining a trigger wheel and not getting home! This is the new MK2 Prototype 4.0 4.6 GEMS Type trigger wheel, 5mm thick, slotted for fit, takes 8mm bolts and is as accuarte as an accurate thing - there is less than 0.1mm on the 2 x bolt holes now to ensure it runs as true as possible. Thought might be of interest ? What's the way you manufacture it? Milling machine, or a very heavy duty laser?